This section examines some of the finest examples of the Mk2 Lotus Cortina in the world today, with the aim of recording what originality looks like for each model, and for each variant of each model. In conjunction with the sections on originality for the Mk 2, this will enable owners and prospective buyers develop an understanding of what their cars looked like when they came out of the factory (for the original specification cars) and will allow a close look at the detail of both standard and modified cars. Mk2 Series 2, August ’68 to July ’70. Additionally, two substantially un-restored cars are presented, both of which had famous owners connected to Lotus and Ford. The first is a 1968 Series 1b car, initially owned by Ford, and given to Ove Andersson who rallied Lotus Cortinas in period. The second is a 1969 Series 2 car, which was presented to Colin Chapman by Ford. 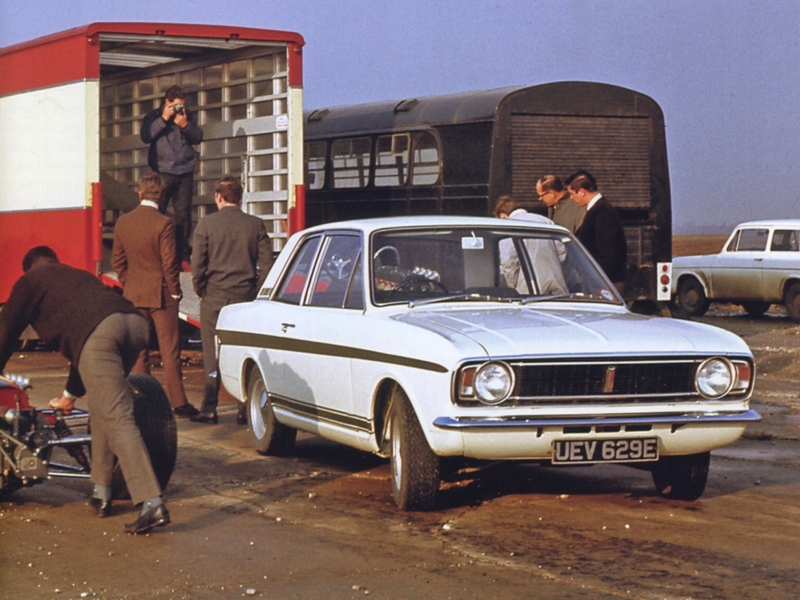 A great photo from the Press Pack for the launch of the Mk2 Lotus Cortina. Although now fully assembled in Dagenham, with the engine shipped in from Lotus at Hethel, Ford were still keen to maintain the association with Lotus and the racing pedigree.